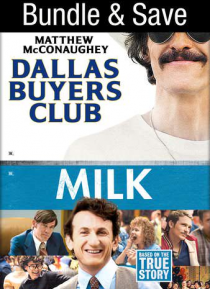 This bundle includes the films DALLAS BUYERS CLUB and MILK. DALLAS BUYERS CLUB: A cowboy takes matters into his own hands after he's diagnosed as HIV- positive and given 30 days to live. MILK: His life changed history. His courage changed lives. Based on the inspiring true story of the first openly gay man elected to major public office, this compelling film follows Milk's powerful journey to insp… ire hope for equal rights during one of the least tolerant times in our nation's history.